An examination of the main themes, or ongoing storylines, in coverage of religion during the presidential race suggests that faith was often viewed through the lens of politics. 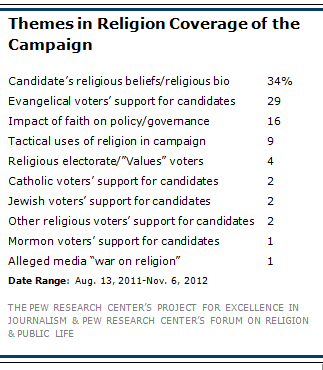 Throughout the 2012 campaign, major media routinely examined which candidate was winning or losing ground among various religious groups as well as how the candidates and their supporters were using religion as a political tool in the campaign. 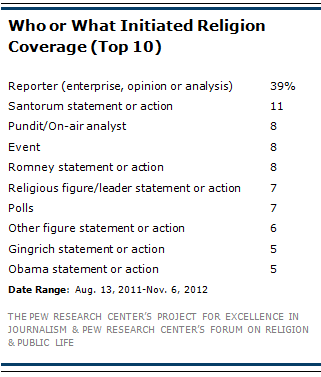 A plurality of all stories containing references to religion (45%) focused on what political commentators call "the horse race," or the tactics of the campaigns and the ups and downs of the candidates in the polls, as opposed to the substance of the candidates’ positions on key issues, their personal histories and their deeper motivations or personalities. The largest portion of horse-race stories (36%) examined how various religious groups, especially evangelicals, would vote. An additional 9% examined how the candidates were using religion as a tactical tool to position themselves or appeal to particular constituencies.